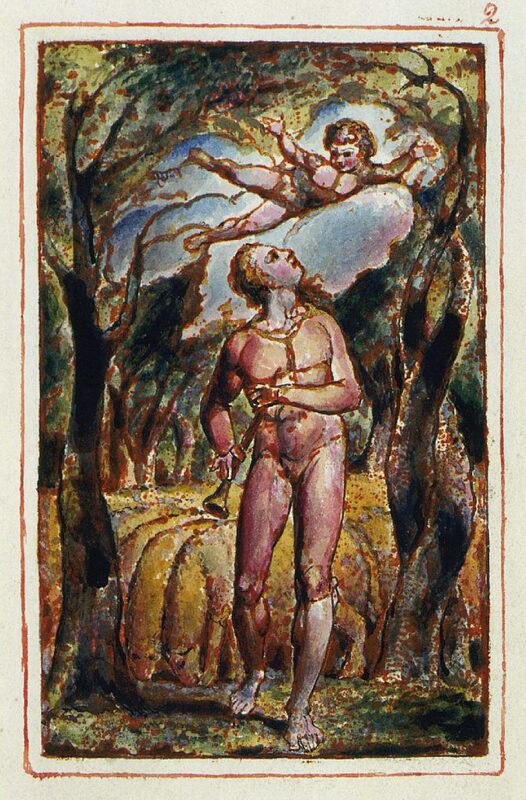 This week in Arts One we discussed Songs of Innocence and of Experience by William Blake. 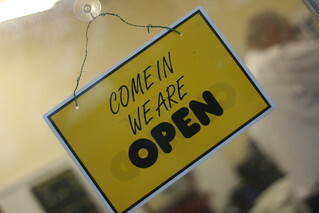 We only had one seminar meeting discussing this week because there were no classes yesterday, Remembrance Day. In our one class we focused in part on considering, based on the poems in Innocence and Experience, what “innocence” and “experience” might signify for Blake. We also spent a little time in small groups discussing particular poems. One thing we didn’t spend much time on, but that is important for the theme of the group we’re in this year, “Seeing and Knowing,” is the fact that the poems are bound up with images. We did talk about a few of the images while discussing poems, but there is so much more to consider. One set of images I wanted to discuss if we would have met in class yesterday, is the frontispieces for Innocence (plate 2) and Experience (plate 28). 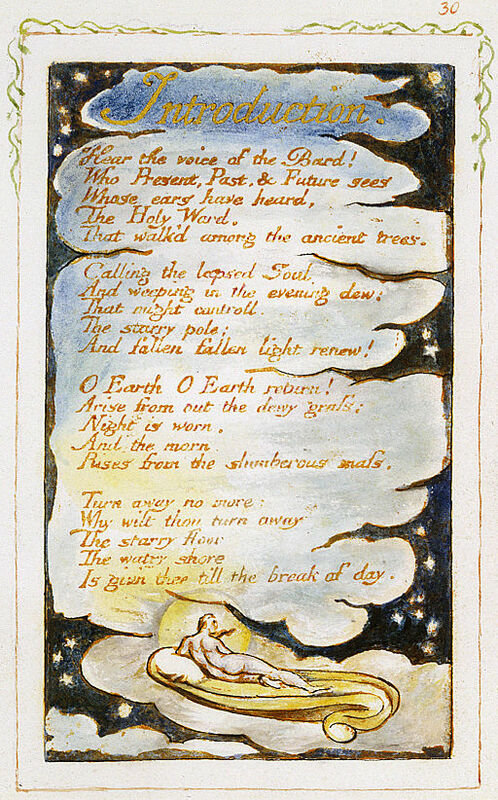 There are numerous versions of Blake’s book, each coloured slightly differently by him (the engraving outlines are the same, but the colours he did afterwards are different). Here is one that is somewhat similar to the one in our book. Here’s a very different version of the same image, from the British Museum. 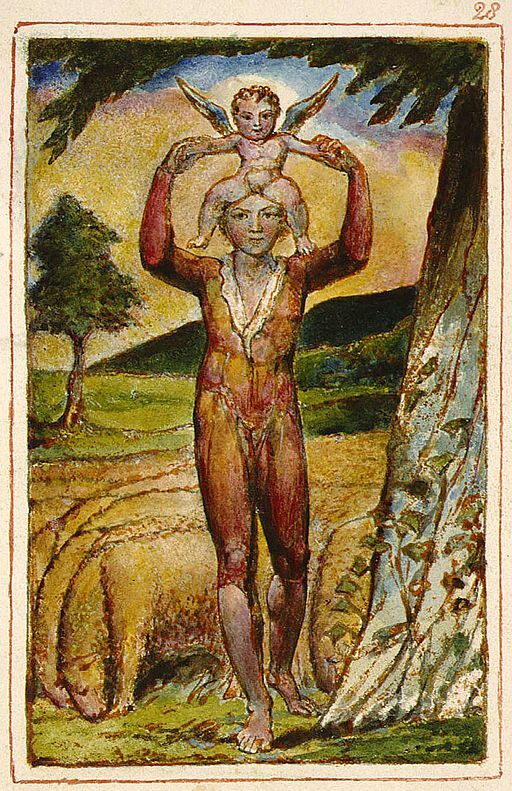 This image connects to the “Introduction” poem to Songs of Innocence, clearly, as it depicts a piper and a child. There’s much to say about this poem in itself, but I’m only going to mention a couple of things I noticed: (1) the repetition of the song the piper is piping, several times, and (2) that the song changes in terms of media. 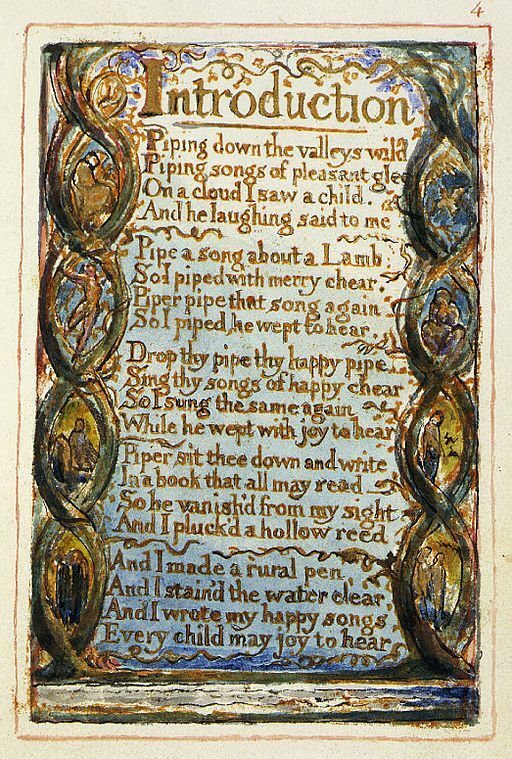 Here’s what I mean: at first, the piper is just piping a song, some song of “pleasant glee.” Here, clearly, the song is just notes from the pipe. Then the child appears and asks him to pipe a song about a Lamb, so he does that–no longer just a song of pleasant glee of some sort, but a song about a specific thing. The child asks to hear it again (repetition), and weeps. Then the child asks him to change the medium: “Drop thy pipe thy happy pipe / Sing thy songs of happy cheer.” So now we might consider that the song has words–though perhaps the piper could just be singing the notes without words at this point. Again it’s the same song, but with a voice rather than a pipe. Next the child asks him to write the songs “In a book that all may read.” The sounds have disappeared into words and pictures: the piper makes a pen out of a “hollow reed” to do so. But notice that a “hollow reed” can also be something you can use to make music. And these poems are still “songs”–the aural aspect of them is still emphasized. They are not just words on a page, but meant to be heard as sounds (perhaps). I’m not entirely sure what to make of this repetition and progression from sounds to words, though one thing it does is to preserve the sense of sound into the words; the piper starts with music in the “valleys wild,” and this music is transformed into a song about a Lamb that is repeated in different ways until it ends up in the book. It almost feels like we’re getting a kind of direct line from sounds in nature to sounds on the page. Another thing that’s interesting is that the child on a cloud disappears when the piper writes the book; the piper no longer has the child for an audience, but instead writes songs in a book that “Every child may joy to hear.” Instead of the one child, the piper has many children (us) for his audience. And as we discussed in class, the “children” mentioned here could be the “innocence” aspect of adults as well as children. I just want to say a few things about the frontispiece image, because mostly what I am thinking about comes out when we juxtapose it to the frontispiece from Songs of Experience. The image seems pretty straightforward: there is a piper who has stopped piping and is looking up at a child who is floating in the air and looking down at the piper. The trees form a canopy over both of them, which is something I noticed happening pretty often in Songs of Innocence (e.g., plates 6, 8, 9, 10 and more) and not nearly as often in Songs of Experience (e.g., there are more trees without leaves, such as in plates 32, 33, 42, 43 and more). There are sheep behind the piper, which might suggest that he is also a shepherd like in “The Shepherd” poem, which follows “Introduction.” Unlike in “The Shepherd,” though, the piper isn’t looking at his sheep, and seems to be walking away from them but stops to pay attention to the child. I have more to say about this image below. This version is the closest one I could find online to the version we have in our book. The main difference between the one above and the one in our book is that the figure with the winged child on his head is clothed in more of a blue-green colour in our text. This image might go along with the “Introduction” to Songs of Experience like the frontispiece to Innocence went with the “Introduction” poem there, but if so it’s a bit harder to tell, and I don’t have much in the way of thoughts about that. From Innocence, the Introduction is about the writer of the poems as a piper who seems fairly simple and connected to the “wild,” while in Experience the Introduction suggests the poems are given us by a “Bard” who has much more knowledge of the world (“Who Present, Past & Future sees”) and who is calling “the lapsed soul” and also Earth to “[Rise] from the slumberous mass.” The Bard is more insistent, more commanding, telling us that we must “Hear [his] voice” with an exclamation point right at the beginning of the poem. This speaker, far from simply piping songs of “pleasant glee” in “valleys wild,” has “heard, / The Holy Word”–he has knowledge of religion and scriptures, and is perhaps using that to help Earth to arise and return from her slumbering. As we see in “Earth’s Answer,” though, this is not so easy; she complains of being “Prison’d,” “Chain’d,” cold and frozen, and can’t seem to free herself. But that’s not my emphasis here; what I’m more interested in is talking about the image in the frontispiece to Experience and comparing it with its counterpart in Innocence. A couple of things strike me right away about the frontispiece to Experience: (1) the adult figure is holding the child figure, now winged, on his head, and (2) both are looking intently, straight ahead. In the Innocence frontispiece they are looking at each other, but here they are staring straight at us. I find it a bit unnerving, as if they are coming out of the page in a way, interacting with the reader in ways that aren’t common in the rest of the text. If we connect this image with the “Introduction” to Experience, then it could be that the adult figure is the Bard, and the Bard is speaking directly to us when saying “Hear the voice of the Bard!”. In that case, the speaker of “Introduction” wouldn’t only be speaking to Earth, who is addressed in the poem as well, but also to us, the readers, who are being addressed with the eyes of the two figures in the frontispiece. The other striking difference to me in the two frontispieces is that in Experience the child figure is no longer flying free, but held down. It’s as if the child has lost its freedom in some way–it still has wings, but is grounded, not flying. There are many other interpretations possible here, and I’ve seen some things in my online perusings (which I didn’t keep track of like I should have!) saying that while the child figure in the frontispiece to Innocence seems like a child, this one is more like a cherub, a religious figure of some sort; this child also has a halo, signifying some aspect of divinity. So perhaps the adult figure here has experience with religion in a way that the one in the Innocence frontispiece does not. There are still sheep in the background, and the adult figure is still walking away from them. It’s clear that in the first frontispiece he is walking with his left foot first and here it’s his right, but I haven’t been able to find anything in my minor efforts at research online to explain what might be significance of that. I haven’t been able to come to any major conclusions by going through this exercise, and I bet we could have come up with more things to say if we had been able to discuss this together in class! I always learn more by doing that than by sitting, thinking and writing by myself. But hopefully this post points to some ways in which one might do a close reading of images (though it could be closer than I have done here), and perhaps will spark some new thoughts in some of the students for their essays! Posted in Arts One texts and tagged Blake, Songs of Innocence & of Experience on November 12, 2016 by Christina Hendricks.